How about cute little individual cherry cheesecakes, all bottled up and ready to be delivered to someone sweet. These little cherry cheesecakes taste really, really good. And everyone loves cute, right? Ok, if you brought one to a man he might look at in and say.. But we girls GET the whole cute thing, don’t we. Sometimes, girls just need to make things “cute”. and darling and all that. thing we are pulling off. 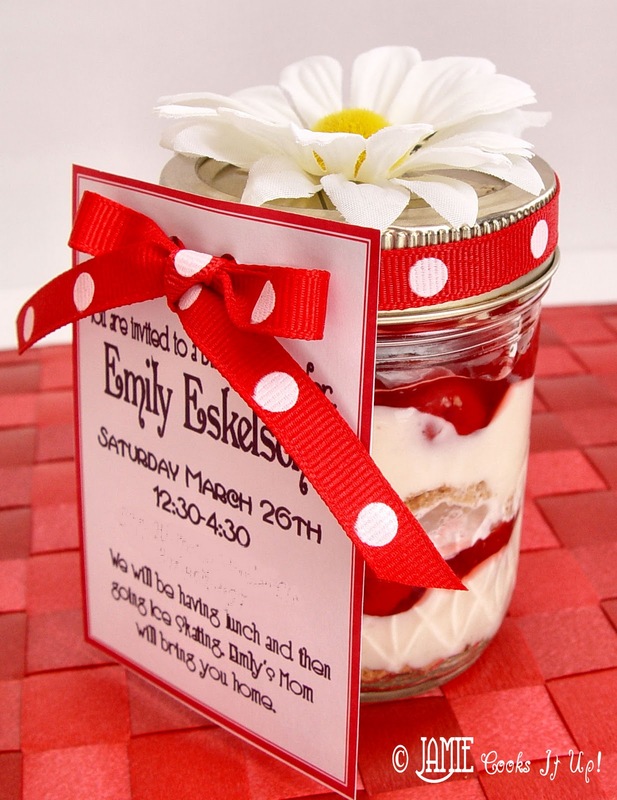 We decided to make these little cheesecake jars into invitations for BlondeEmily’s birthday party. There are all kinds of “cute” things you could use these for…. Hope you make some soon! 2. Process them up into fine crumbs. 3. Add your sugar and melted butter. Mix until combined. 4. In your stand mixer, or in a medium sized mixing bowl beat the cream cheese until smooth. Scrape the bottom of the bowl with a rubber spatula. Add the sweetened condensed milk while you continue to beat the mixture. Once it is all added beat for about 3 minutes, or until smooth and silky. You may need to scrape the bottom of the bowl again to be sure all of the cream cheese is getting incorporated. 5. Add your lemon juice. Mix for 1 more minute to be sure everything is combined nicely. 6. Be sure your jars are nice and cleanly washed. 7. Layer about 2 t of the graham cracker mixture. 8. Then about 2 T of the cream cheese mixture. Try not to let the above picture give you a headache! You vision has not suddenly gotten blurry…I must have been moving around a bit while I took this picture! Pardon the fuzziness. 9. Layer about 2 T of cherry pie filling over the cream cheese mixture. 10. Spray in a bit of whip cream, and smooth it out with a spoon. Then repeat the layers again. 11. Put on the lids and rings. 12. To attach the invitations, simply punch two holes in the top of each invite. Wrap the ribbon around the lid of the jar and through the two holes. Tie your self a lovely bow and hot glue the flowers on tops. 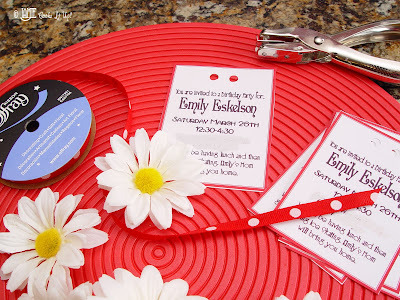 Vwalla…..invitation ready and done. Refrigerate until you are ready to deliver them. Also, they will stay good for a few days if you need to make them ahead. These are soo cute!! I was curious- do you have to refrigerate them? How long do they last?? Thanks for your question. They do need to be refrigerated, and will keep for a few days if you need to make them ahead of time. Have a good one! I love this idea and I am so excited to use it as gifts for people I love. You are a genius, woman!!!! I am so incorporating these darling little confections into refreshments for Relief Society (Enrichment Night. I can not stop calling it that; I must be old) meeting. What a great way to kick off spring! That is so awesome! I haven't seen anything like that before. Who doesn't love cheesecake? I'm trying to think what is coming up that I should make those for – Mother's Day??? Most guys don't get cute do they?! LOL But, yes, us girls love cute..something about how it makes the day brighter and makes our heart smile. Thank you for sharing such a lovely idea and it sounds yummy too! Great Spring idea! “Made it on Monday” is a WEEKLY link, you can link up every week Wed.-Sat. 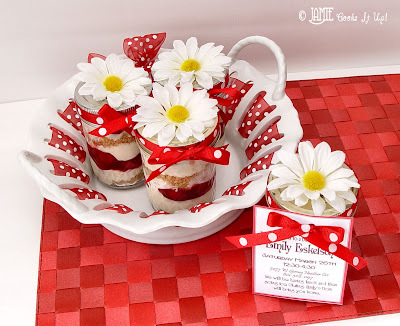 Really really fun Idea and so yummy! Thank you for sharing!!! Way cute – perfect V.T. happy spring gift. Thanks, I love your blog. Loved this receipe and can't wait to use it! Love your website! Instead of cherry pie filling, do you think I could use strawberry pie filling and it still taste just as delicious or should I just stick with the cherry? Any berry pie filling would work well. Strawberry, blueberry, raspberry…all super yummy. Good Luck! Hope you love it! Thanks to my neighbor Misty Maki for introducing me to your blog. Your ideas and recipes have saved me many times! 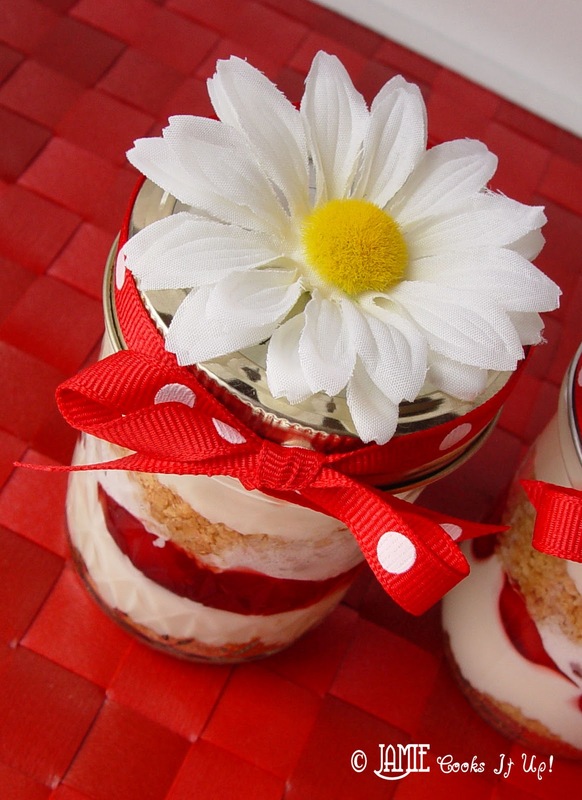 I teach a group of ten 10-year old girls for Activity Days and I had them put these cherry cheesecake jars together for Mother's day gifts. Instead of an invitation tied to it, they tied on a Happy Mother's Day card they made. They all had a great time and were excited to give their gifts to their moms 🙂 THANK YOU! THANK YOU for this lovely idea! I made this for all the mothers in my family and here in Guatemala, we celebrate Mother's Day today. I did them with Strawberry Filling because couldn't find the cherry one, but… let me tell you… this is just the perfect combination of WOWNESS!!! It's awsome and delicious and lovely and easy to make and packed with flavor and color and just loved it. I did also tied a Happy Mother's Day card to each of them and well, I hope they all love it as I did! Thank you, and Happy Mother's Day to you! Do you have this in a regular pie recipe?